Carlos Araujo Ilustrador | Illustrator: Selecionado para o Bikefriendly Imagination! | Bikefriendly Imagination Selected Artist! Selecionado para o Bikefriendly Imagination! 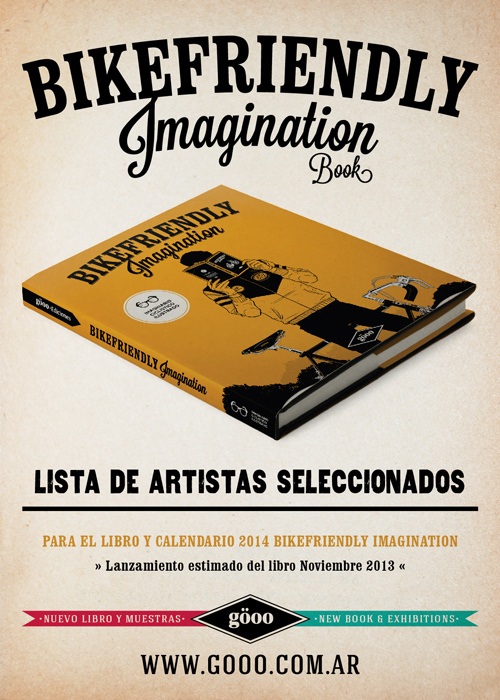 | Bikefriendly Imagination Selected Artist! Bikefriendly é o projeto mais ambicioso da Göoo Ediciones: A partir das obras selecionadas teremos uma exposição/evento itinerante que irá percorrer vários países da América Latina… O lançamento do livro está previsto para Novembro de 2013. I just got the news that I am one of the artists selected to be part of an upcoming special project from Göoo Ediciones (Argentina): The book "Bikefriendly Imagination" will showcase 121 selected artists (from more than 600 submissions) and their unique visions about bikes and everything related to this much need form of transportation... There are enough cars in this poor little world of ours...! Bikefriendly is possibly the most ambitious project from Göoo Ediciones: From the selected artwork will come an art show that will be seen in many countries in Latin America... The book will be available sometime in November 2013.